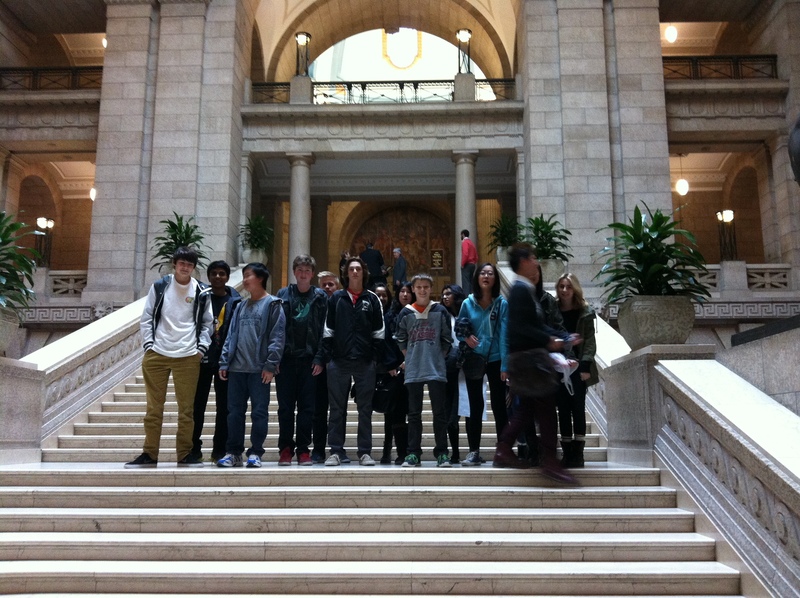 What a great day we had at the Legislative Assembly of Manitoba and the Law Courts! 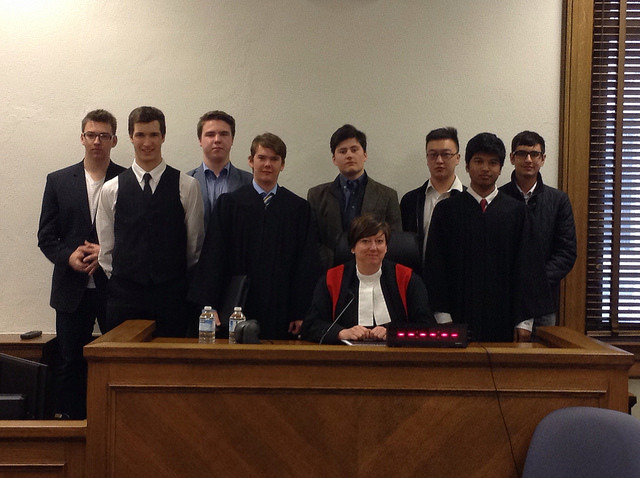 We were able to take in Provincial court, Queen’s Bench, and even the Manitoba Court of Appeal. 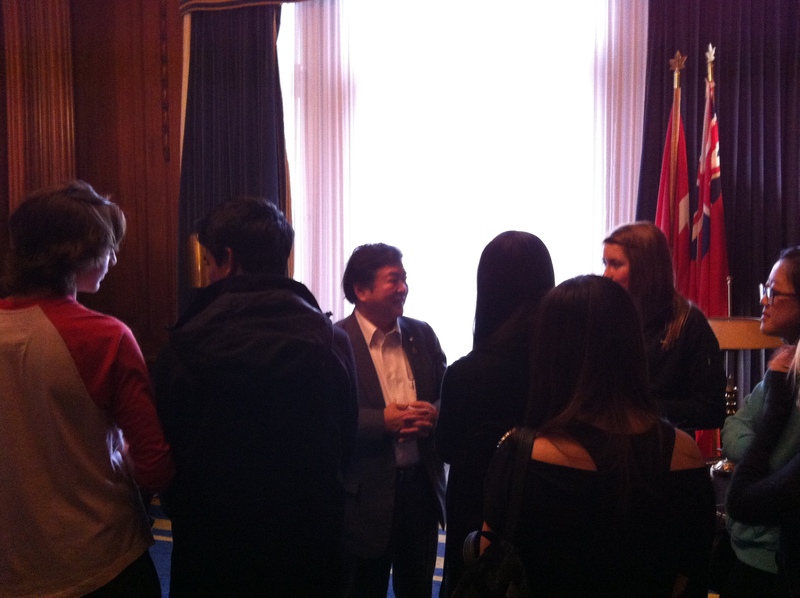 We were also able to sneak into Question Period, chat with the Minister of Education, and even meet the Lieutenant Governor. This was all fun, but let’s see if we we were able to learn anything or apply or theoretical knowledge from the curriculum. Here is a link to the Provincial Government’s curriculum for this course: Canada in the Contemporary World. Sift through the outcomes and see if you can identify certain elements from the document that you observed at either the Courts or the Legislative Building. Below, write about what you observed and provide examples. 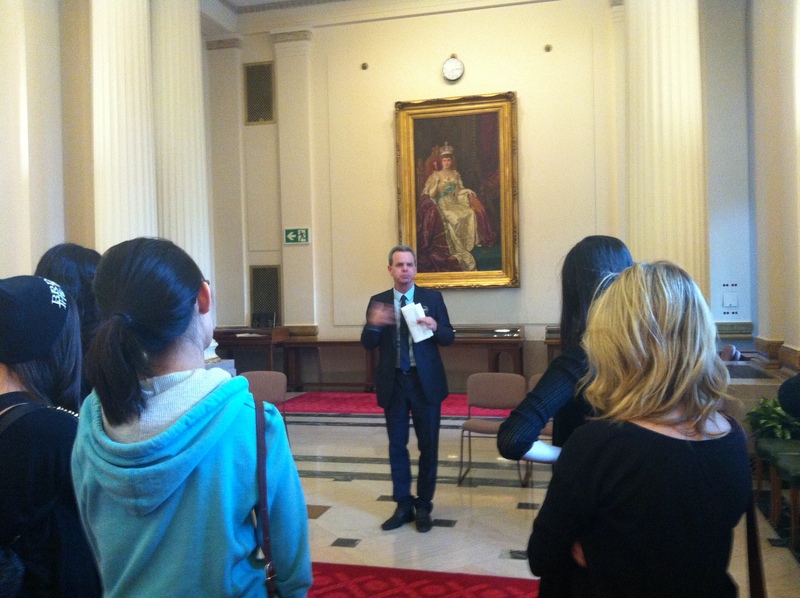 Minister of Education, James Allum. Try to prove that you have achieved these outcomes which the people of Manitoba want you to learn. Secondly, what surprised you or challenged your assumptions at either place? How as the Legislative Assembly different from City Council? Write a comment below. Feel free to respectively comment on what each other are sharing. Remember to provide concrete examples from our amazing trip! When I was taught Canadian history a million years ag0 (1992), I was given the generic story about Confederation: what were the causes, who were the fathers of Confederation, etc. Later in life, however, I began to read about radical history from the likes of Howard Zinn and began to look deeper at Canada’s story. My students have recently delved, as an exercise in history, at juxtaposing traditional views of history with alternative perspectives. As such, each student has selected a “father of Confederation” and described his rationale for wanting a federal union while creating a character, most likely marginalized by the establishment, who would have been affected by Confederation. The result is two very different histories which help to identify cause and consequence on a much larger scale. We have uploaded our work on a Google document whereby you can make comments. Please feel free to contribute constructive criticism and/or ask questions. Just click on the image to access their work or click here. A few weeks ago, famed physicist, environmentalist (man, I have an issue with this term), intellectual, and activist Vandana Shiva spoke at the Canadian Museum for Human Rights as part of the Fragile Freedoms lecture series. Unfortunately I missed the event, but I was able to take in the lecture for the CBC Ideas broadcast yesterday on my run. As a teacher of the new Global Issues course in Manitoba, a parent, and someone who thinks about our connection with the earth, I am highly fascinated and concerned with the current destruction of our biosphere. As an educator, I am always surprised that most of our PD or conversations relate to technology, PISA Math scores, or guided reading – given the fact that the very thing that sustains us is about to revolt. In her talk, Shiva focuses greatly on the notion of systems thinking and how over the past few hundreds years we have put humans on a pedestal above all other species and the earth itself. Shiva refers to this as the shrinking of man, that we have made ourselves something unique and different that is superior to all other systems on this planet. Shiva takes us through this evolution by touching upon how the likes of Descartes, Newton and Bacon, who began to break down ideas into small parts and suggested that man had some sort of superiority over nature. She moves from Descartes’ reasoning, I think, therefore I am, to today’s, I consume, to where we need to be: I live, therefore I am. Her thesis that we are all connected to the earth essentially connects with all ten major themes in the Global Issues curriculum, but also points to a larger conversation that we, as educators, should be having about what and how we teach. Perhaps we should be looking at providing learning experiences that allow students to see their connection to all systems on earth in the pursuit of what we often refer to as transformation. This means that Math and technology may have to become partners in education, as opposed to these leviathan-type creatures we have made them out to be. Further, we may need to reorganize this notion of schooling so that learners can actually see the world in systems, and not as micro silos of knowledge. In any event, please take the 55 minutes required to play this podcast for your students. It might be the most valuable lesson we can offer them. A city high school teacher was cleared Sunday of accusations he planned and carried out the cold-blooded murder of a suspected drug trafficker who plunged to a grisly death from his balcony. The only eye-witness to the crime is examined by the Crown. An emotionless Wally Brogue, 28, left court Sunday a free man after a provincial court judge found she had serious doubts about the key element of the Crown’s case against him. Judge Tracey Lord ruled the testimony of an eyewitness wasn’t reliable enough to pin a first-degree murder conviction on Brogue for the July 14, 2013 death of her boyfriend, David Benning. Brogue faced a mandatory sentence of life in federal prison without a chance at parole for at least 25 years if convicted. Benning died tumbled from his balcony after an argument with Brogue, who admitted he’d been drinking and went to confront Benning at his apartment for framing his younger brother in a drug deal — a move which landed Brogue’s kin in jail. But, Lord said, it made no sense that Brogue would toss Benning over the four-foot-high railing of the balcony to his death, Lord found. “Mr. Brogue needed Mr. Benning to be alive to exonerate his brother,” Lord ruled. Brogue, a teacher and youth counsellor, had no prior history of violence. Volsky testified Brogue turned up unannounced at the apartment she and Benning shared, roughly pushing past her when she opened the door. He then angrily confronted Benning, she said. She said Benning responded by calling Brougue a “fool,” after which came a fatal scuffle, she said. “Wally pushed David over the railing,” Volsky testified. Lord found Volsky’s level of intoxication (she admitted being “buzzed” from marijuana at the time of Brogue’s visit) left her unable to rely much on what she said. Volsky had also conceded she was in love with Benning and was prepared to lie in defence of that. Prosecutor Rishav Kayastha failed to prove Brogue had planned out the killing. Through the testimony of a serial convict, Kayastha presented to the court comments Brogue allegedly made the day before Benning’s death while visiting his brother, Tom, in jail. Repeat B&E artist Peter Tomas told Lord he’d overheard Wally say concerning things. “He was angry. I even hear that he want to kill David,'” Tomas said. “‘That creep does not deserve to live,'” he said he overheard Brogue telling Tom. Tomas’s credibility took a major hit, however, when he told defence lawyer Will Rattray he was testifying in hopes of gaining an advantage at an upcoming parole hearing. 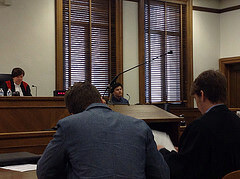 In an unusual twist in a first-degree murder case, Brogue took the stand and denied any involvement in Benning’s death. He said after simply asking Benning to come clean with the truth about his brother’s frame-up, Benning rushed at him and tripped himself over the balcony’s railing. The Crown, Defence, and witnesses pose with the Judge in a bizarre moment of solidarity. The case marks the second recent homicide in Winnipeg where a person fell from a building under murky circumstances. In November, police charged Adam Perrier, 33, with manslaughter and forcible confinement after Christopher Meier fell three floors out of a window at the Royal Albert Arms hotel and died. That case remains before the courts. To Err is Human, To Cheat is a Cry for Help? A colleague of mine recently put out a survey to some of us “humanities-type” educators on whether or not we wanted to invest into some anti-plagiarism software. What ensued was a conversation between another colleague of mine, Mark Duncan, and I on how and why people cheat and what our role is, as educators, throughout it all. Mark is a really cool customer, a brilliant English teacher, an amazing writer, and fountain of knowledge when it comes to music produced in the last 1000 years, and a mentor. He has been at our school for 35 years and is essentially the institutional memory of the joint. My point is that I respect him deeply and our chat raised some pretty important things to think about in terms of assessment. He was willing to allow his words to be used here. To others: What do you think about this? I might suggest changing how we assess as a means of curbing plagiarism. I don’t just mean in terms of changing the assignments from year to year, but also the tools. Don’t follow you, Matt. Can you say more? If we offer the same assignments each year, then some kids will cheat. If we offer the same assignments like everyone else at every other school, some kids will cheat. The key is not to have kids simply right a reflection piece on Fifth Business or on the causes of Confederation (for which I am guilty), for example, but to have them think and communicate about ideas that are specific to their experience. For example, one essay Heather and I assigned this year asked students to speak to how the Indian Act may have located to the two main characters of Three Day Road in the middle of a European war. It was fundamentally impossible for kids to cheat. We also might want to consider different forms of evaluation – oral evaluation, evaluation whereby students have to interact with peers, with authors, experts, etc. If the assessment is authentic and meaningful, then I have found there is little room and desire to cheat. Rather than trying to catch kids at cheating, I think we should offer them opportunities to be original. I wonder how many kids cheat in art class? I would bet that there is a sizeable market for Grade 12 major papers out there. What if you changed it up? What if students had to interview an author and then read his or her book? What if Grade 12 students were assigned mentors? What of their essay wasn’t an essay at all? What if, what if?! Just my ramblings. By no means do I suggest that I have the answers, but the issue was dangled out there and I had to take the bait. I have cced a few folks in the case that my message was equally unclear for them. Would love to hear your thoughts as this is an important issue that needs many voices. I differ in my assessment of why kids cheat. You seem to be suggesting that the fault is actually with us, since we don’t offer them enough opportunities to be original, our assessments are not “authentic and meaningful”, we aren’t original enough ourselves to come up with new topics every year, etc. This seems to me to be putting the shoe on the wrong foot. There’s this thing called human nature that sometimes gets in the way of making good choices, and the last time I looked adolescents were human. (Well, most of the time.) C. S. Lewis said that there are two indisputable facts about the moral life: 1. We all know, at least past the age of 13, what the right thing is to do, unless we possess no conscience 2. We all know that quite often we don’t do that thing. Kids – like adults – are lazy. They are also – again, like adults – easily tempted. Then they sometimes make poor choices. I am all for original approaches to assessment, and I try my hardest every year to come up with plagiarism defeating topics. The subject matter we deal with in English, however, often makes that a difficult task. There are a number of factors that contribute to the downfall of the tragic figure, for example – an important topic in the study of literature. I cannot change what Shakespeare or Sophocles wrote. How much literary criticism, now available online, has been written on how those factors operate in, let’s say, King Lear? The mind boggles. This is a different situation, it seems to me, than what prevails in a Visual Arts class. (I don’t even know what a plagiarized art assignment would look like. One way around this would be to set assignments on writers who are not exactly in the mainstream. I think this idea has merit, but it cannot stymie human nature. Two years ago, I set a topic on an incredibly obscure story, and two of my Grade 12 students plagiarized from the one online source that my exhaustive search for criticism could uncover. Speaking personally, I never nail kids for plagiarism unless I am 100% convinced that they have taken the easy way out by copying and pasting blocks of words from online sources, copied someone else’s homework or, more rarely, appropriated ideas that are clearly not their own. Turn It In would make it easier to catch kids who decide to do that. That’s all. If we don’t decide to get plagiarism detection software, so be it – we will just continue to do the aggravating detective work ourselves. But I think it is important to recognize that this is not our problem – it belongs to those who make bad decisions, and we have to insist that they own them. I am not suggesting that student cheating is the fault of teachers. I agree that students who cheat are responsible for cheating. I am also not suggesting that anyone’s assessment practices are not meaningful or authentic. I am just responding to a general malaise communicated to me concerning the regurgitation of major paper topics, sources, and ideas. I think my main point is that we, as teachers, can only fundamentally control one variable when it comes to the issue of plagiarism: That is the learning experience. I guess my argument would be that we would be better served putting resources into the design of learning experiences, as opposed to trying to catch kids cheating via a software program. This might prove a more fruitful endeavour for everyone and it might elicit the critical thinking and communication we/I claim happens at our school. I agree that plagiarism is the fault of those who commit the offence, but adults need to help those who feel that they have little choice and we also need to create environments where by the thought never crosses their minds. These notions are perhaps Utopian, but I would prefer to prance around on this side of the issue than become a member of the Plagiarism Police. You raise some good points here. Thanks for taking the time to do so. Your idea that some students feel they have “little choice” but to cheat is an interesting one and deserves further discussion. I agree that creating an environment in which the thought to cheat never crosses a student’s mind would be a Utopian project – one worthy of Swift’s projectors. But I hope this doesn’t make me a happy member of the “Plagiarism Police”, as you put it. That would be a strange badge – no pun intended – of honour. Few things make me more crestfallen than a plagiarized assignment, and I always mete out justice with a heavy heart. So, here we are – two educators concerned about plagiarism, but looking at it from two different perspectives. I suspect, as Mark and I are finding, that there is some middle ground – room for the cheaters not to cheat and also for educators to create assessment tools that inspire, include, scaffold, nudge, and fundamentally promote the creativity and critical thought we demand.